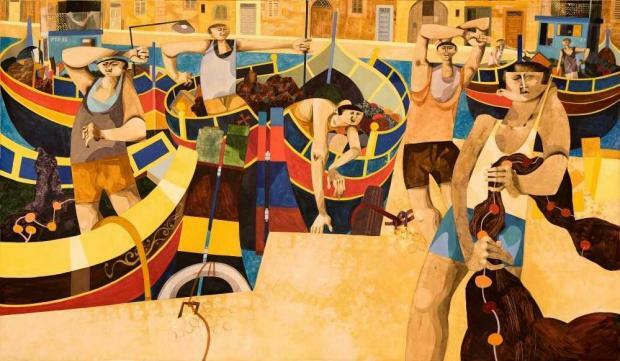 British artist George Large has donated one of his paintings to the Malta Maritime Museum. Large set up his first solo exhibition in Malta at the National Museum of Archaeology in 1984. Now that he is retiring with his wife in England, he donated one of his artworks to Heritage Malta since he wished that part of him would remain on the island which he has come to love. George Large is known for the way he blends his particular interest in shapes and working people with location, activity and colour, presenting intricate and restless works of art. Large’s most known artistic characteristic is the exaggeration in bodily form. His figures, consisting mainly of men, are typically disproportionate, with big heads, over-sized hands, and rough and uncouth bodies. The active figures animate the locations which he depicts vividly. Large’s preferred medium is watercolours. Yet sometimes he paints in oils, usually on a large scale. Although he was very prolific with watercolour works which depict Malta, the few oils relating to the island can be counted on one hand. The large painting of Fishermen at Marsaxlokk which the artist has donated to Heritage Malta is one of these exceptions. Its theme is in honour of the hard-working fishermen and their beautiful characteristic Maltese boats.